We know how hard it can be to make ends meet until your next payday. Whether you need cash for three days, three months or until your next payday, we want to get you the right amount of cash for every situation and give you the flexibility and control you need. Unlike a Payday Loan or an Installment Loan, a FLEX Loan gives you the ability to apply once and withdraw cash at any time (up to your credit limit). And unlike a payday loan or installment loan, with a FLEX Loan, you pay it back at your own pace, with conveniently scheduled payments, or installments, aligned with your payday. FLEX Loans are anywhere from $25 up to $4,000. We offer FLEX Loans both online or at any one of our 24/7 locations all over Tennessee. Here’s how it works. Your due dates will be the same as your paydays. You have the option to pay only the minimum amount due on your payday or pay an additional amount so you can pay down your balance quicker. There’s never any late fees. As you pay down your balance, you will have access to take out additional cash in the form of a cash advance up to your credit limit. An Advance Financial FLEX Loan puts you in complete control. You can pay off your loan early without penalty and we will even keep your line of credit open so you can withdraw a cash advance at a later date. If you have any questions, feel free to call Customer Service or ask one of our store associates for more information about our fee structure. You can receive $25 up to $4,000. You can pay an installment on your FLEX Loan anytime and you only pay interest and fees for the amount of time you keep the money. Is there a lump-sum payoff or can I make payments or installments? It’s completely flexible. You can pay the minimum installment or payment due on your payday or you can pay the full sum of your loan anytime you like. Minimum and Maximum payments or installments by amount borrowed and loan length. These rates and terms are examples for Tennessee only. The above examples do not include all available loan amounts. The Total Finance Charge includes the Periodic Interest Rate and the Customary Fee. 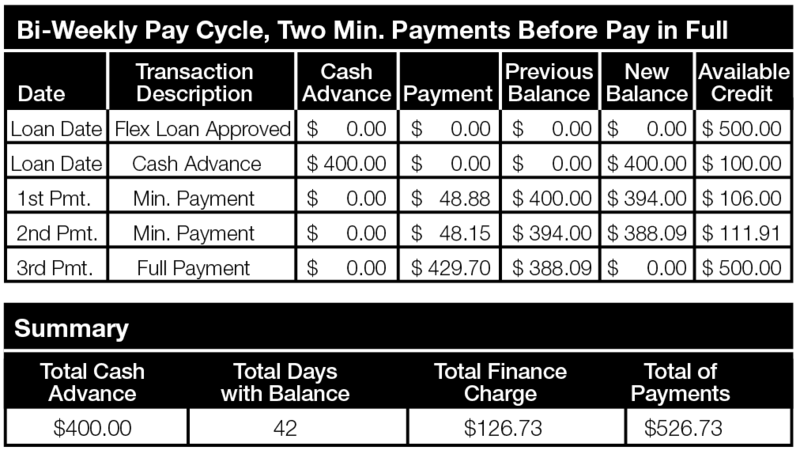 The example below shows one cash advance with two minimum payments or installments prior to payment in full. This is only an example. We do not require two minimum payments on your payday prior to payment in full. This payment example is for Tennessee only. Advance Financial loan agreements are governed by Federal and applicable laws of the State of Tennessee.